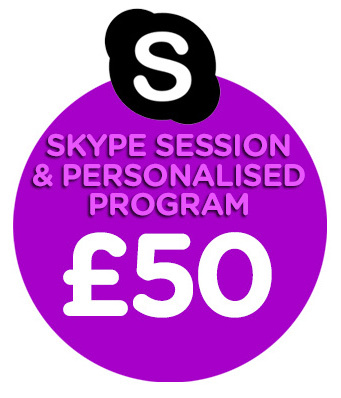 Train with me via Skype and get a personalised monthly program . I can help you achieve your goals via skype .We can have an initial 15 minute free chat to discuss your goals and at this point you can also show me what fitness equipment you have at your disposal. At our session I can both check your form and show you the correct form . Once we have worked through the exercises I can then send you a program with correct reps and sets to follow. We can then check in at an agreed regular time. 1-to-1 sessions in my private gym. I can also travel to you. © Copyright TrainWithJames 2017. All Right Reserved. Site by Dice Design.